As the Crystal Cabin Awards, the “Oscars of aircraft cabin innovations” gets ready to celebrate its tenth year, it has gained its first official airline sponsor: Emirates Airlines. The Crystal Cabin Award Association is once again calling for submissions for the most recognised and respected international prize in aircraft interiors design and technology. As in prior years, the panel of judges will seek out the most innovative ideas and products which would contribute to a better flying experience for passengers. Entries will be accepted on the Award’s dedicated website from now through 4 November 2015, and the winners will be announced, as they have been from the beginning, during the Aircraft Interiors Expo (5 – 7 April, 2016) in Hamburg. The 24 industry expert members of the jury will evaluate the merit of submissions individually considering their level of innovation, the potential to improve the in-flight experience, and the concept’s commercial viability. This past year’s winners included established industry companies, such as B/E Aerospace, ViaSat, Embraer, and Etihad Airways, but the awards also recognise young independent innovators to encourage and promote an interest in aviation and to bring a fresh perspective on the possibilities still available to the industry to revolutionise life in the clouds. “In the ten years of its existence, the Crystal Cabin Award has become an international heavyweight. Its visibility reaches well beyond the industry’s borders and it plays a substantial role in defining trends and innovations on board aircraft. This success story would never have been possible were it not for the outstanding voluntary commitment, year on year, of our Judging Panel members from all over the world and the Hamburg Aviation team,” says Dr Holger Friehmelt, Managing Director of AAT Composites in Cape Town and a CCA juror from the beginning. This year, the categories have been refined to sharpen the focus in these fields. Now its jubilee year, The Crystal Cabin Award has an eighth category: “Cabin Concepts,” allowing room for more blue-sky thinking from the industry. The organisation attributes its decision to add a new category to the rapid expansion of the global market for aircraft cabin products. The Crystal Cabin Award is followed closely by the aviation industry, and has been for many years. But just being shortlisted is enough for many companies and products to garner attention from media around the world. Those chosen as the three finalists for each category by the Judging Panel get a chance to present their concept to leading figures of the industry in person at a Final Viewing. Crystal Cabin Awards are then presented at a gala dinner, as part of the Aircraft Interiors Expo in Hamburg. This new category is provided for full cabin concepts that are already existent or at a market- ready stage. The Cabin Concepts category is tailored for airlines as well as manufacturers and design companies. 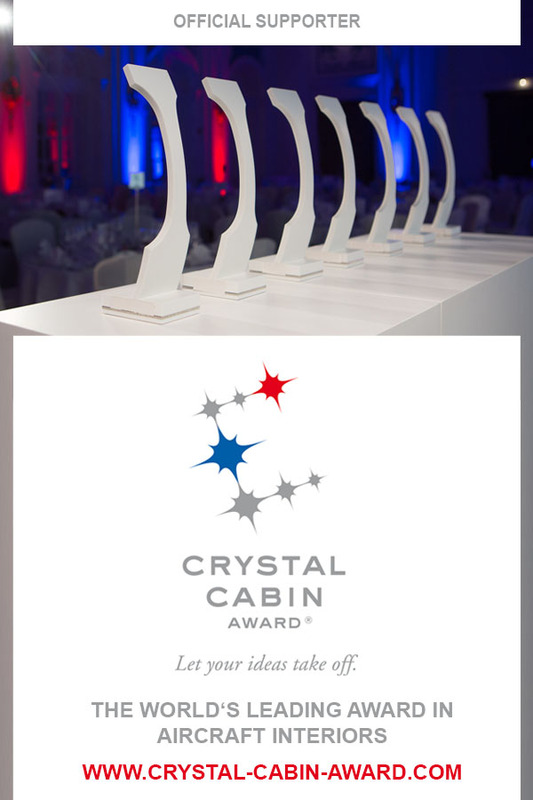 The Crystal Cabin Award organisation has also taken its jubilee year for a refreshing makeover, with a new online presence just in time for the start of submissions, which features a more user-friendly and mobile-friendly design to its site. And, for the first time, the Crystal Cabin Award has official backing from an airline. The Crystal Cabin Award organisation has announced that Emirates will support the industry’s “Oscars” as a Platinum Sponsor. This puts Emirates airlines in a leadership role within the industry, encouraging creativity and innovation in design, engineering, and applied sciences. The Crystal Cabin Award is open to additional sponsors. Information on sponsorship opportunities is available from the organisers.